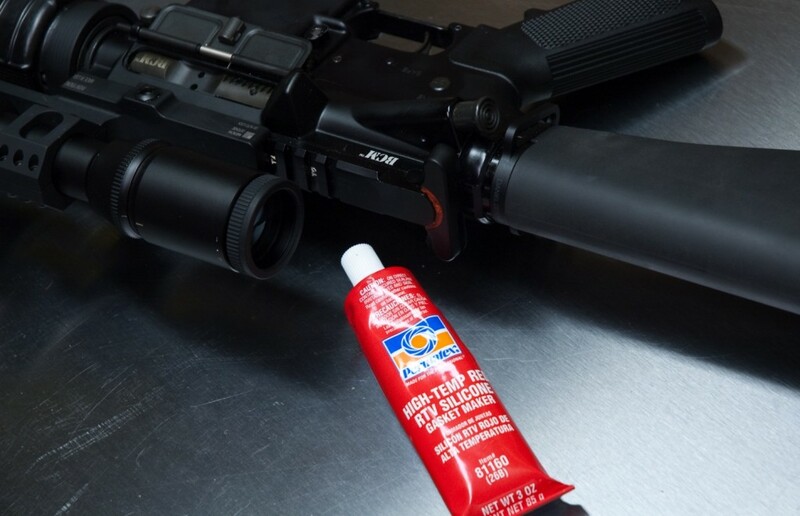 If you shoot AR-15s with your nose to the charging handle like many do, and you run your AR wet with lube, you’ve probably had this problem. What problem is this? It’s all that oil and carbon being outgassed between the receiver and charging handle gaps and angled into your glasses and often –your eye. This leaves globs of oil and grime on your eye protection after very few rounds and it obscures your vision. There are ways to fix this. You can buy specialty charging handles (money and diminishing return), not shoot ntch (I say no), or run your AR dry (inadvisable). One method I did not mention is modifying the charging handle you currently have. There’s no need to cut it up and compromise the structural integrity, this idea is much simpler. As you can see, there’s a nice red filler in the former gap between the receiver and charging handle. The charging handle is not affected by this as the RTV substance is adhered to the charging handle only. 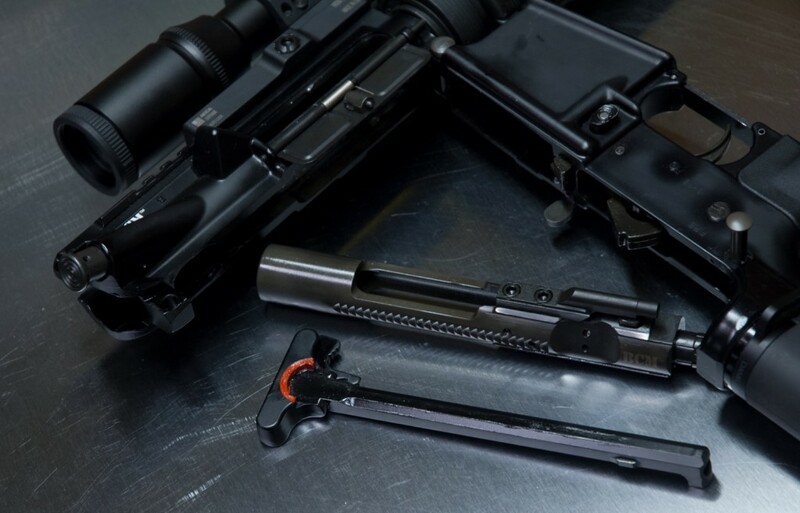 Your AR-15 and the charging handle. Brake cleaner, acetone, or similar degreaser. What you do is simply degrease the charging handle and then position the charging handle to maximize the gap between the charging handle and the receiver. Simply put: with the charging handle all the way forward, give it a light tug to the rear to maximize the space due to the design tolerances. This is going to be barely a millimeter in size of a difference between the forward position and the rear position. There’s some play when a charging handle is forward with the bolt and you’re just trying to open that space up within the tolerances of that play. With the charging handle like so, dispense some of the RTV into the gap similar to how it is in the picture. Level it out with a scrap piece of plastic or something suitable –it doesn’t need to be perfect. Let it dry as per the instructions on the packaging. Once dry, use a sharp knife to cut between the upper receiver and the charging handle carefully making sure the RTV is sticking to the charging handle and that you free it from the receiver.